At Clarity we don't run Adwords a lot for internal use. Our philosophy focuses around SEO and the organic results, while our PPC accounts are used for testing or specialized situations. But occasionally we'll begin a marketing sprint that puts us into advertising mode. It's always a fun learning experience, and our most recent run yielded some interesting results. Of course, when we DO run AdWords advertisements, we like to measure as much as possible in order to gauge and increase effectiveness. We use WordStream's report generator to get some quick data. 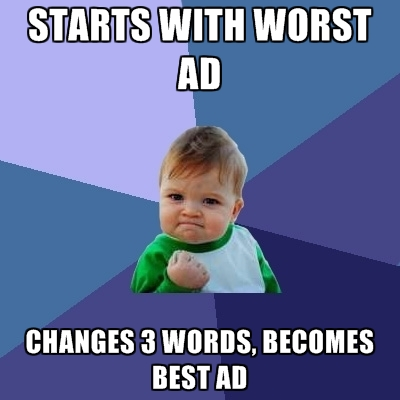 One of the many great things about WordStream is its free instant analysis on your AdWords campaign(s). With a quick account authorization, WordStream spits out an automated report with useful data. One of the sections of this report is an overview of the best and worst advertisements in your campaign. Pay attention to how close they are to being the same ad. Now, keep this in mind: We wrote many ads for many services with different titles, descriptions, intentions, etc. However the best and worst ended up not only being focused around the same service, but were essentially the exact same advertisement with a modified 3rd line of copy. Personally, I've always had a lot of success using the word "Free" in my copy and offering something of value to the visitor. You can see that in the worst performing ad, we offer a free project planner. The best performing ad is the exact same one, but replaces that offer with a mention of our DNN certified partner status. This reverses an assumption I carried that offering something for free always adds value to a pitch or advertisement. You can see that in this case it fails really hard. Essentially, the test shows that we are overestimated phrases with free offers and underestimated phrases that establish credibility and define our business accomplishments. So remember kids, always pay close attention to every word in your pay-per-click ads. Even the 2nd half of the 2nd description line could make or break them.